Some of you may have noticed I have been quite for a little while! I haven't been blogging or sharing content half as much as i'd like to, but it's all been for a good reason. Myself Lindsey of Loula's Boutique (a clothing brand for ladies and girls) and the incredibly talented Beth of Bethany-Jane Makeup, for the last few months, have been working hard to create something pretty big! On Tuesday the 12th June, we got together with 15 Yorkshire Wedding based businesses and 11 absolutely stunning models to create a beautiful wedding style photoshoot. The aim of the day was to bring local independent business together to create a collection of images and footage that we could each use to showcase what we each do best, not only that, as small businesses, I really hoped that we could come together and support one another in getting each others names out there through the sharing and tagging of the images created. I've personally found, as a small independent business, it so much better to stick together and support each other as opposed to trying to compete with one another. This logic has served me well in business and from it I have gained a whole bunch of people who I now call friends who have helped and supported me and really helped to make Loula's Boutique flourish! The planning all started about 3 months ago, the first thing on our list was finding a venue. This probably should have been the most difficult task of all, see as small independent businesses, we don't have the funds to spend on such prestigious events so we usually have to rely on the kindness of others. So I set out by researching wedding venues and emailing each of them to find out if they might want to get involved and support our goal of helping local independent business. As expected, due to the large price tags that come with wedding venues, most of them understandably said no. Hope was not lost though, as amongst the the vast quantity of no's, we had a yes!! Which incidentally was my favorite venue of them all! Carlton Towers an absolutely breathtaking stately home in Goole East Yorkshire. Not only were they really keen to help and support local businesses, but they couldn't do enough for us in terms of planning and the set up on the actual day making the whole process of finding our dream venue a walk in the park. 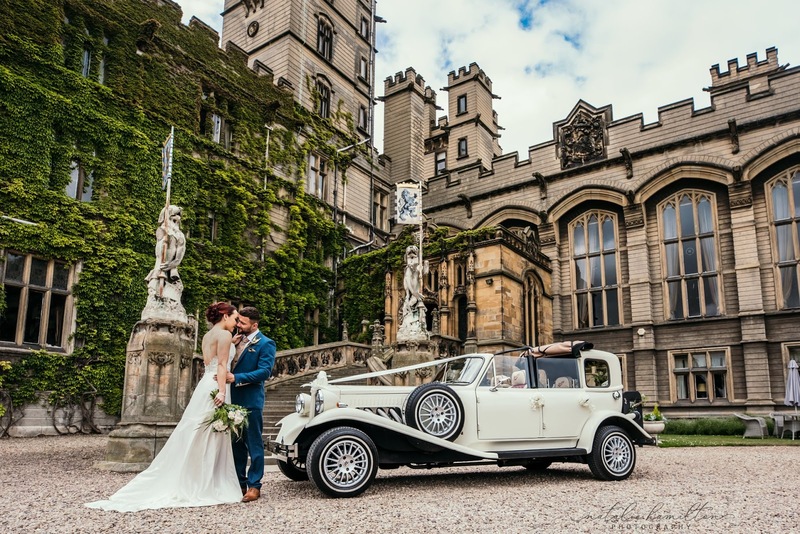 We felt like we'd really set the bar high landing Carlton Towers as our venue, so the next port of call was finding equally amazing wedding related businesses to get involved. Beth and I got together over a drink (or three) To put together a list of people to contact and then divided the workload between us. Selecting a wedding dress business was a no brainer for me. It had to be the incredibly talented Claire Paver of Claire Paver Couture. Not only one of the most talented people I know but also an old friend of mine. Claire and I have collaborated on previous photoshoots and catwalks before, so it only seemed right that she was there on this day. Claire's own designs have a real bohemian feel to them, but if that's not your thing, she also offers a bespoke serve where you can have your own ideas designed and made to measure. The quality of her work is outstanding. 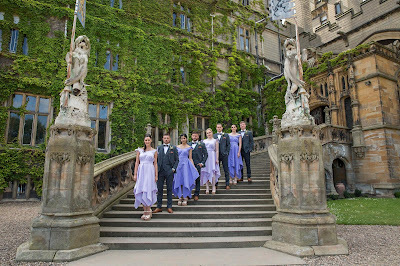 The bridesmaid dresses were my own label Loula's Boutique. I've previous made dresses for bridesmaids and wedding guests in the past but have only recently decided to pursue that market more. I wanted to showcase a new aspect in my design by opting for a more traditional look for the first set of dresses. This look was a stunning peach/pink full length gown with a v-neck front. I am really pleased with the outcome of this and I'm sure you will be seeing more of this in the future. For the second set of dresses I wanted to show a variety of different designs, all made in the same fabric. I felt like this element is something that that is lacking on the market. 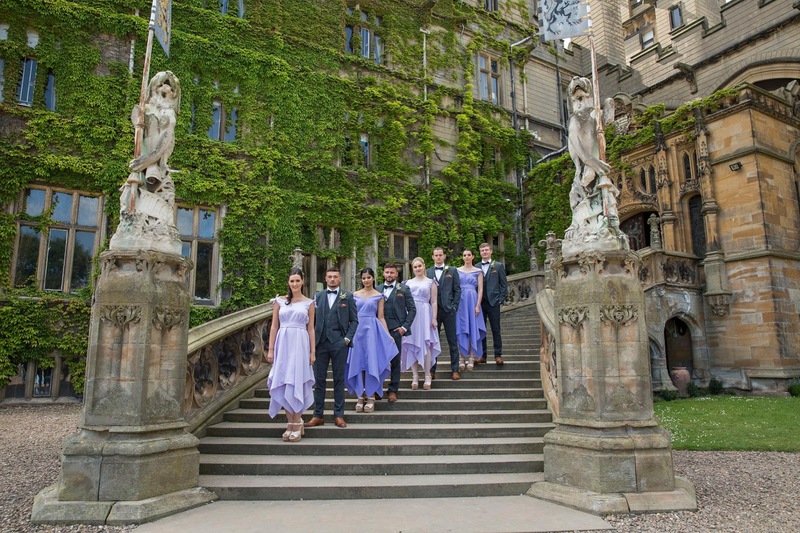 It allows bridesmaids to each show off their own personality, whilst still looking like a collective group. For the third set, I opted for the same dress, made in 2 different shades of lilac. Again, keeping the group looking like a collective, but this time best matching the different pallets to the bridesmaids skin tones. After a lot of research on men's suits, I knew I wanted something slightly edgy to sit well alongside my bridesmaid dresses. 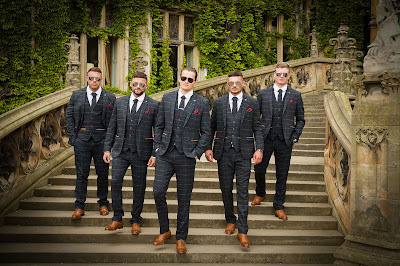 Of all the men's suits I have ever seen, I am absolutely in LOVE with the Marc Darcy checkered suits which have a real peaky blinders edge to them. Luckily for me, I just so happened to be following on facebook a stockist of these suits. H & L fashions a beautiful little boutique situated in Hayworth. 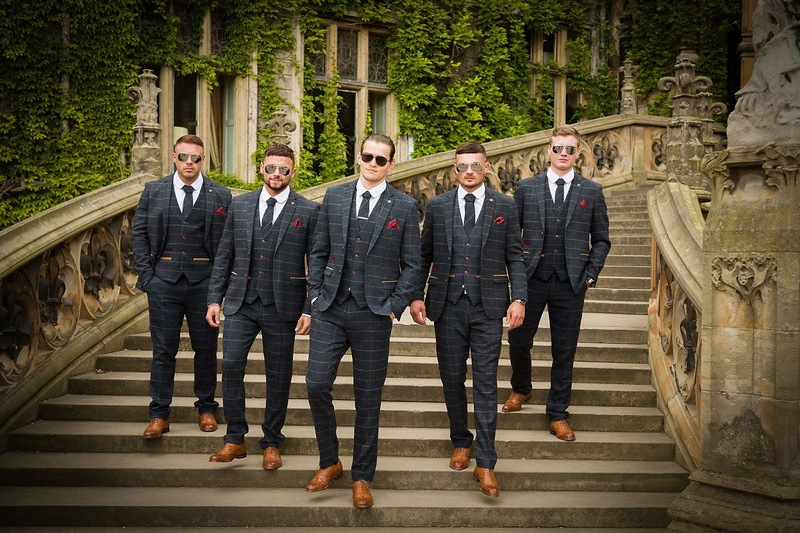 As well as stocking these amazing suits, their customer feedback is absolutely amazing as you can see from their facebook reviews. Throughout the whole process of planning and organising, Helen from H&L was so supportive and organised. Working with this company was a dream and you will definitely be seeing more collaborations from us in the future. 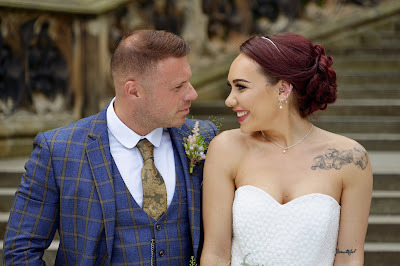 The makeup was beautifully created by my very amazing co-organiser Bethany Laurance of Bethany-Jane makeup a self taught freelance makeup artist from Selby who specialises in wedding and event makeup. 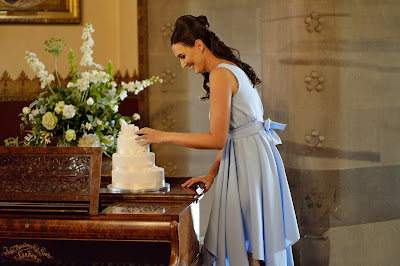 Beth and I have worked together of several different projects and the idea to do a big wedding photoshoot is something that we have both wanted to do for some time. I could not have asked for a better co-organiser as Beth is always reliable, hard working and has a brilliant creative mind not only this but she by far one of the best makeup artists I have ever worked with. 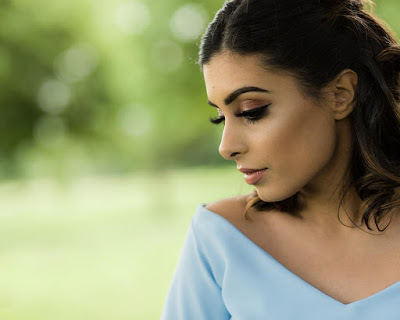 Beth's makeup is inspired by american brands and techniques and for this shoot was inspired by a new york bridal expedition she recently visited which was showcasing the beauty and naturalism of a wedding day. The makeup look was natural and subtle to enhance each models features rather than shadow them. You can find more of Beth's work or book her for makeup via her facebook page Bethany-Jane makeup. We were very lucky to have Sophie Moran on hair styling for this shoot not only did she save the day by stepping in very last minute but she also created not one but six incredibly beautiful hairstyles for this shoot in such a short space of time. Sophie likes to create hairstyles that are on trend but that are also timeless so that people can look back on their images in years to come and still love their look.The bridesmaids styles for our shoot were inspired by some of her previous work at a recent wedding she had done with half of the hair up and the the other half down (perfect for girls who can't decide between the two!) and softly curled giving a stunning romantic look which fitted our theme beautifully. Each girls hair styling slightly varied as all hair lengths were different but as a whole all shared the same collective look. 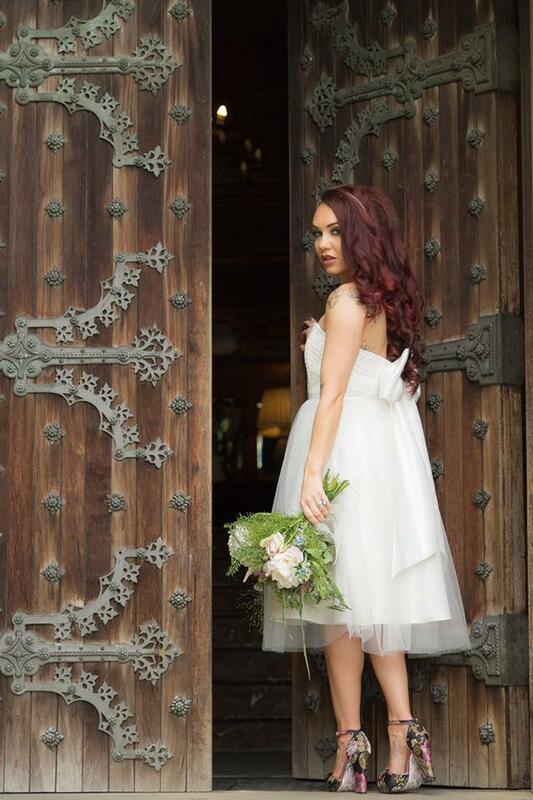 Our bride Tor had a more complex styling again with the soft curls but this time incorporated into a beautiful updo. You can find or book sophie for hair on instagram at or Sophie Moran hairdressing by visiting bohemian hair boutique Leeds where she works. I knew from the word go whose company I wanted to take the spot for our wedding car. 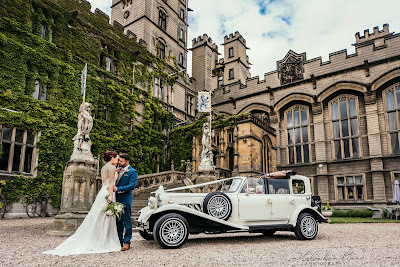 My friend had previously been married at carlton towers and had this stunning picture taken outside the venue with herself and her husband kissing at the bottom of the steps next to the most beautiful vintage car I have ever seen! This picture inspired a lot of my ideas for the shoot and I really wanted to try and recreate it. After contacting my friend for the details of the car company, she put me in touch with the the lovely Wayne of Wans wedding cars who happily agreed to support our event and bring not only one but 2 of his wedding cars along to the day. It was an absolute delight meeting Wayne on the day, he is such a lovely person who couldn't do enough to help and work around our schedule. 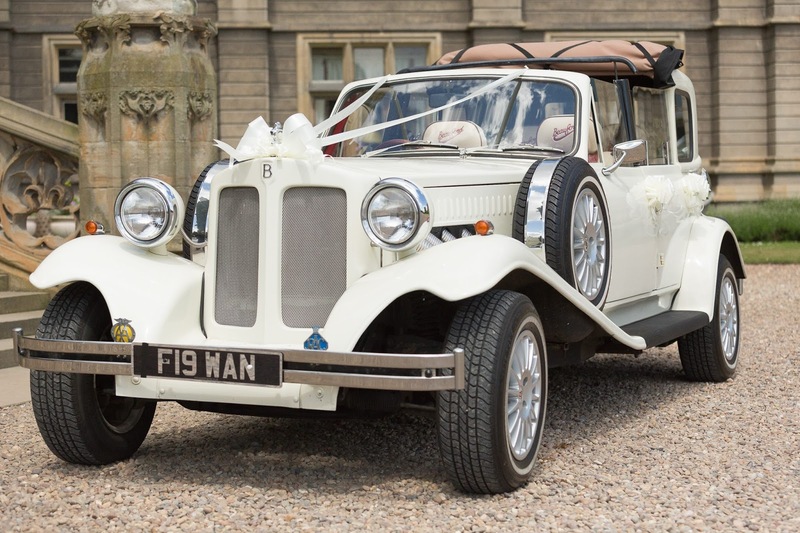 He treated the event how he would an actual wedding with the cars arriving in immaculate condition decorated in ribbons of our colour choice. 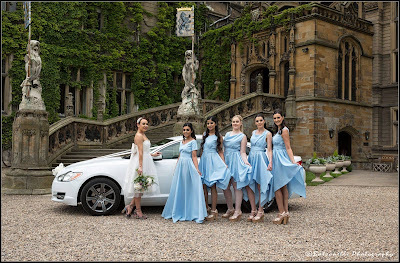 The girls on the shoot absolutely loved the vintage car, whilst the boys swayed more towards the Jaguar! 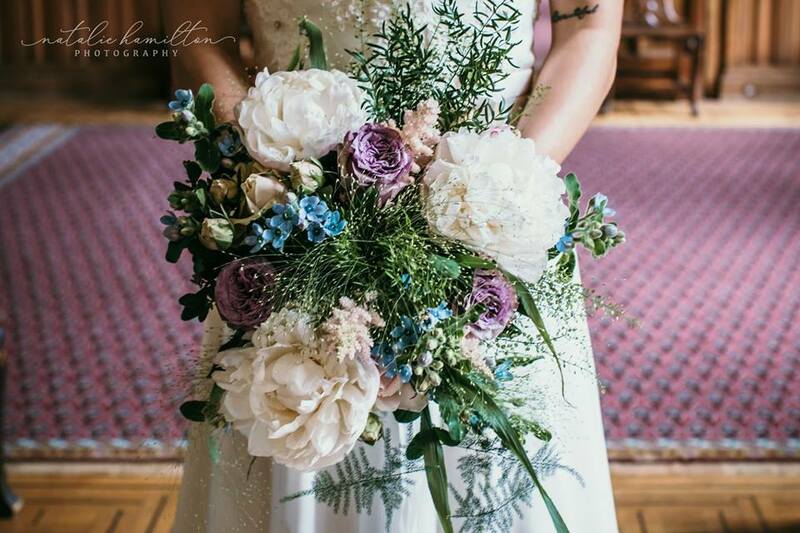 Our beautiful bridal bouquet and buttonholes were made by the amazingly creative Lisa of Lisa's Florist Selby. I came across this gorgeous shop a while back when my partner kindly bought me a huge gorgeous bunch of them and I have been in love with this little shop ever since. So as you can imagine, I was absolutely delighted when Lisa agreed to be involved the the shoot. The colours in the bouquet were selected to compliment the colours of the 3 different sets of bridesmaids dresses. I was a little unsure as to how the mixture of all three colours would pan out, but the results were so far above and beyond anything I could have wished for. The flowers have a real rustic edge to them and are so pretty and creatively put together. The buttonholes all slightly varied which really added to the edgy overall look. I first met John of J&S photography some years ago at a charity fashion shoot. Since then we have worked together often on many projects. Along the way John teamed up with Shane to become J&S. These 2 are like the Chuckle brothers of the photography world, never a dull shoot! It only seemed right that they were first in line to take part in this one. They did not disappoint, from the get go John and Shane were helpfully involved in the planning and organising and as always were incredibly reliable and brilliant. What I love about these 2 is their passion and hard work and that they always deliver exactly what you ask for. Laurence never ceases to amaze me with his photography, we have worked together on a few different occasions. He is definitely the dark horse of the photographers in that he under sells his ability, comes to shoots and stands back ground and then somehow produces the most amazing pictures! What I love about Laurence's work is his eye for creativity, he always seems to effortlessly capture models at the perfect moment where they look their best with the most idyllic backdrop. His work has an almost dreamlike feel to it. I briefly met Gill at a charity photoshoot some years ago and I have never had the opportunity to work with her since, so I was delighted when she contacted me and asked to be involved in our shoot. After looking through Gill's previous work on facebook, I really loved her ability to really capture the moment and peoples expressions. I feel like each photographer was bringing a different style of photography and hers again was a something different on board adding to and enriching our team. Gill was an absolute pleasure to work with, a very friendly and genuinely nice lady who made everyone feel at ease and her overall results from this shoot were amazing. Natalie was the last photographer to join our group, we were a little worried by having too many photographers on board but we were so happy we decided to include her! Although we have never worked together before, a quick glance of Natalies work on facebook really shows how talented she is. What I loved about working with her is her her ability to direct and pose models resulting in absolutely incredible over all results. She really made sure she individually focused on each of the businesses involved in the shoot, creating for each, images which really showed off their product/talent. Natalies work is absolutely breathtaking, a must see! Our videographer Barney of Shortman productions wedding videograpghy was highly recommended to me by a friend and he really did not disappoint. This was the first time i'd ever had the opportunity to work with a videographer and I was really unsure about how to direct his role within the shoot. This was no problem for Barney who had clearly had loads of experience and kindly took the initiative of directing his own role in which he decided to do a behind the scenes take on the whole day. This really helped take a weight off our shoulders and I imagine this would apply to any bride and groom on their wedding day with having so much to think about and do on the big day. You can find a short preview of Barney's work on our shoot here. Our Models were a mixture of experienced and first time models. Some of which we have worked with before, some were old friends and some we met for the first time that day. All of them were brilliant and professional nonetheless and i'm sure each of them will have many more modelling opportunities to come in the future. What I really loved about this bunch is how much they all bonded on the day and i'm absolutely sure that new friendships were formed from this event. After months of hard work and planning for this shoot, we had so many worries for the big day. Were people going to get along? Would everything go to plan? Could we keep timing? Overall, we couldn't of wished for a more successful result. We knew we had a good really team of people and venue but i'm not sure we knew just how good, every single element was absolutely stunning. I was overwhelmed by how good everything was. Everybody instantly clicked and was relaxed and helpful. making the day run smoothly. This was by far one of the hardest but the BEST photoshoot I've ever done! A huge THANKYOU to everyone who made this possible, I can't wait for our next venture.